Our team of minions is currently scrambling like crazy to pick your freshly printed, hot-pressed, new-book-smelly guide off the shelves and pack it into a DawnWing delivery bag. We aim to get the book to you as quickly as possible, so you can read it, learn from it and get cracking on your entrepreneurial adventure. We need juust a few details from you. Most importantly, your delivery address. If we don't got that, you don't got your book, comprende? - so here you go, a little bit more admin, then you're done. If by some weird chance your book does not arrive in the next week, please do feel free to let us know by emailing us here. You are welcome to use foul language (it shows passion!) and include graphic detail of your frustration. If however, you get your book in double-quick time as intended, then you're also welcome to email us a review of your glowing satisfaction. Brought to you by Heavy Chef and Xero, the Heavy Chef Guide is a recipe book outlining all the ingredients you need to get cracking with your world-changing idea. 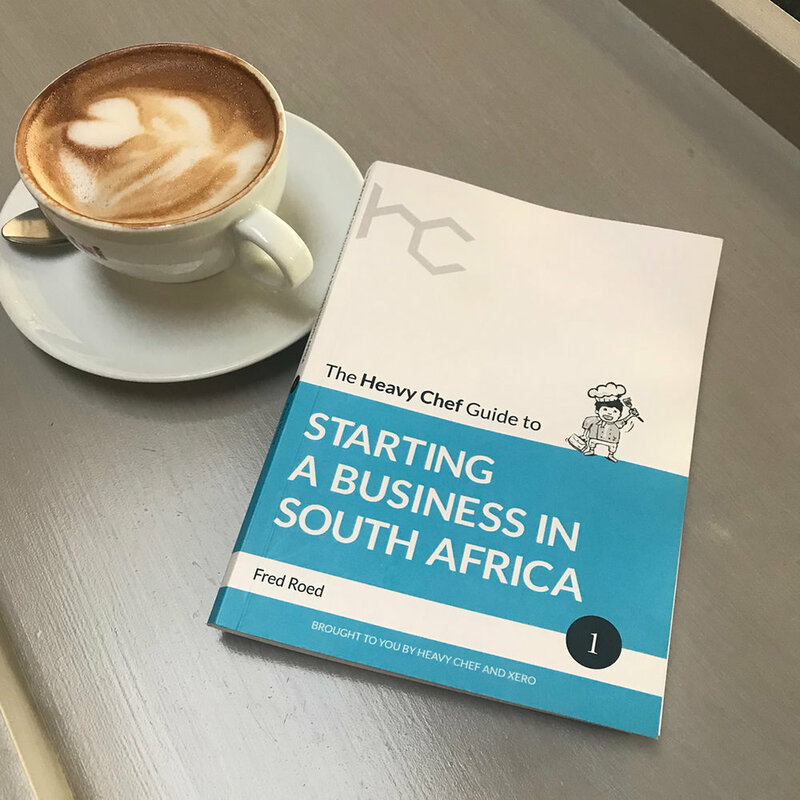 Author Fred Roed is CEO of Heavy Chef (Pty) Ltd. He has started several businesses, as well as mentored dozens of successful startup entrepreneurs. Packed with loads of insights from other Heavy Chefs, this is a funny, accessible and brutally authentic guide. “South African startups and small businesses account for 36% of the GDP. “We have access to all the tech and contacts and ideas we could wish for. This allows us to think and create and dream, but starting a business is not easy. "Super easy to read, really practical and full of great locally-relevant advice. I also enjoyed the stories of local entrepreneurs throughout the book. But what sunk in for me, in particular, was the concept of being a Heavy Chef." “I genuinely was blown away by the book. It is honest, it is relevant and it gives you all the feels that there are people out there who want you to succeed. Whose success is your success. Whose failures are willingly offered to mitigate your risk of making the same mistakes. And I say mitigate because I now understand that maybe Silicon Valley’s mantras are right. Failure is as much a part of the journey as success is, and keeping going is the only way to get there. If you are a budding entrepreneur, I would highly recommend getting your hands on the guide. "Great book! I really enjoyed it. Very easy to read and has loads of really useful information."